Hunger still a major challenge - How does Aid Africa help? Food Programmes: Maize Feeding Programme. goats milk for vulnerable babies, likuni phala for toddlers, monthly Elderlies Luncheons. We’re promoting and enabling development of high value nutrition - moringa, soya, rabbits - and our livestock teams benefited from amazing veterinary training from CVM, US! Borehole pumps repaired returning clean water to thousands and the pipeline extended into Bilisoni Village. Extreme weather - cyclones and flooding devastate buildings, sanitation, crops - disaster mitigation. 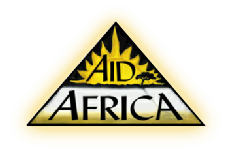 Hunger increasing - how Aid Africa helped…..
13 borehole pumps repaired - clean safe water back to 45,000 people. Houses, toilets, bridges, and a Community Centre built. Reforestation Programme begun. Increasing hunger - increasing help. Another Community Centre built in a remote area, Primary School water tank installed, borehole pumps repaired, more goat kids born and business loans issued. Solar lighting introduced …..
A different kind of year - yet the “routine” projects continued to impact rural Malawi: our 2016/17 Food Programme fed about 1500 people through the 3-month hunger period, vulnerable babies received our goats’ milk and fortified porridge and dozens of teens were supported in secondary school. Frail elderly folk enjoyed lunches twice a month, and we continued to distribute tree seedlings for planting in the communities for fuel, nutrition & soil improvement, vegetables, and restored water by repairing a water pipeline deep underground.